walk from Christchurch town centre and 6 miles from the centre of Bournemouth. The Flat is NON SMOKING. It will accommodate up to 4 people but we do not take pets or children under 8 years old or babies. Fishing available in season. FREE Wifi is available in the Flat. are provided free of charge. Towels are not provided. and is about 10 minutes walk away. from the bus stops which are within 100 metres of the property. have to fish around his boats. Graham & Pat have been letting this Flat since 1980. We now have many guest we can call friends that return each year. We maintain the Flat ourselves an clean it ourselves between each let. 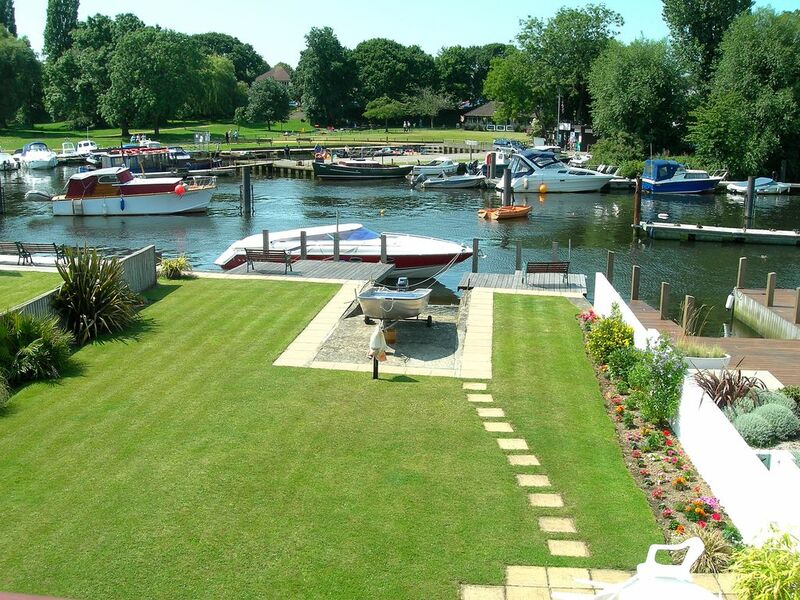 The QUIET RIVERSIDE LOCATION is the main reason guests return each year as well as being close to the historic town of Christchurch, the New Forest and of course many beaches. A flat in a superb location overlooking the River Stour with a short walk into the centre of Christchurch and a longer most enjoyable walk to Hengisbury Head. The flat was extremely clean and comfortable with everything you could possibly require and the owners were very helpful without invading our privacy.We hope to return next year. Excellent position with very pleasing outlook. Good to have bus routes so accessible, and enjoyed the riverside walks. We stayed in early March. Welcomed by helpful owner who gave us a comprehensive instruction of the workings of the property which is well appointed, warm and snug. Comfortable beds, settee is a bit tired - got a backache. Two armchairs much better. Felt the sealing round the door (connecting with garage??) at the foot of the stairs could be improved. On entering, having been out all day, could detect a 'workshop' type paint/cellulose smell. It was not evident upstairs. Warm and friendly welcome. Lots of good advice. Flat was warm, comfortable and very clean. Fantastic views and position. Spacious, light, comfortable, awesome views, great location. We enjoyed lots of cycling each day around Christchurch, Bournemouth area plenty of fabulous natural sites too see. After being outdoors most of the day in all sorts of weather, it was especially comfortable to relax make a wonderful meal, wine and hot bath. Will hope to come again in the near future. Perfect property with ideal location. My wife and myself stayed in the property for a week in September. The flat was lovely, spacious and clean with the perfect location. It is a short walk to Christchurch. We enjoyed it so much we have booked again for next year. Thank you for your excellent review. We look forward to seeing you again next year. We have just returned from a great week's holiday in this holiday flat, which was very clean and the location superb. We had the added bonus of perfect weather which made our stay even better. We hope to return again next year.